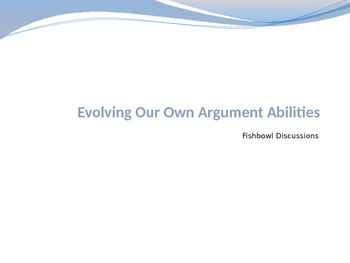 This presentation includes a comprehensive experience with fishbowl discussions. 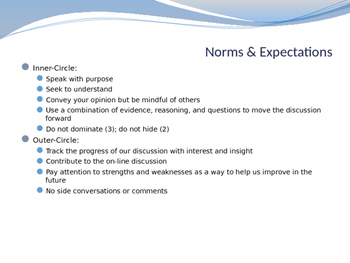 The power point includes 4 open-ended questions with directions, goals, extensions, and a reflection. I was inspired to create these questions and implement this routine in my class due to last year's argument question. The seemingly simply question really stumped students, and I realized that my own students needed practice deconstructing and exploring these "simple" questions that are actually pretty complex. Without a doubt, this was one of the most effective and interesting mini-units I did in my class this year. Students thoroughly enjoyed the opportunity to discuss topics like language and free speech, meanwhile advancing their argumentation skills. Some students grappled with these questions in the beginning of the unity, falling victim to the notion that simple, common questions yield straight-forward, typical answers. Not so! They soon learned how to "dig deep" and interrogate their own thinking to consider relevant issues in a new and productive way. 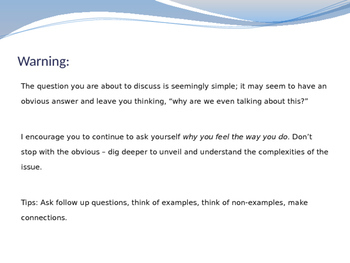 I've included notes for some of the slides, and I've left it in an open format so you can edit if needed. Please contact me if you'd like a hard copy of an evaluation form. 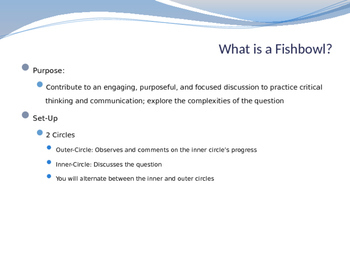 A fishbowl rubric is coming soon!